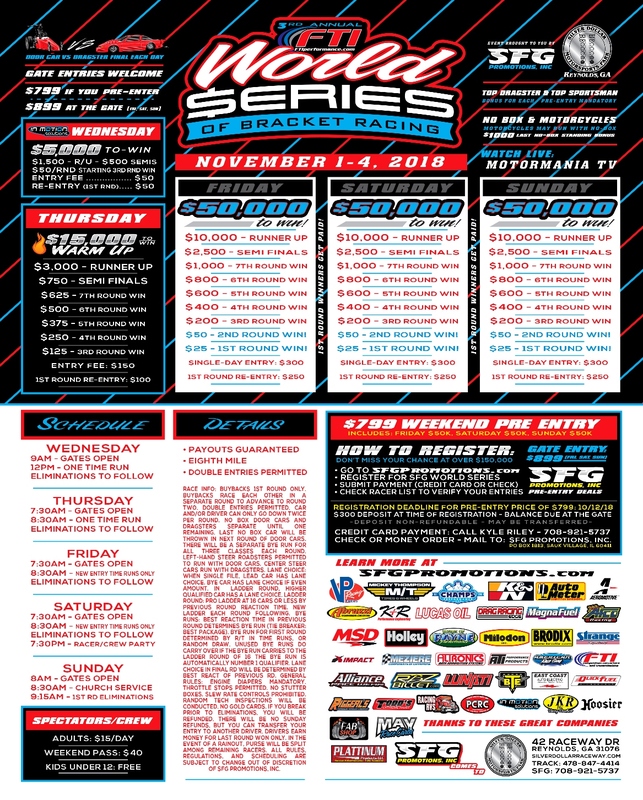 Reynolds, GA - Live Coverage from the SFG World Series of Bracket Racing goes live Wednesday at Noon E.S.T. 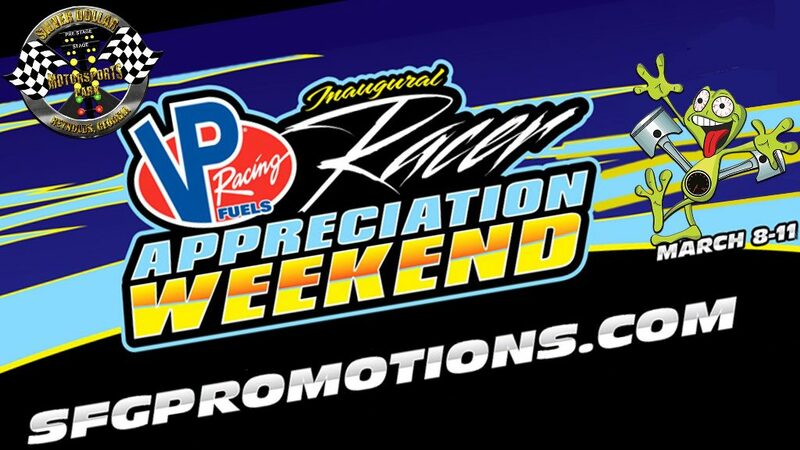 and continues thru the weekend at Silver Dollar Raceway in Reynolds, Georgia. CLICK HERE for Live Video and Chat! Reynolds, GA - Super Stock saw a pair of hitters face off in the final as Mike Crutchfield and Jimmy Hidalgo went to battle. Hidalgo was out first but Crutchfield ran him down at 9.156, 135.81 to Hidalgo’s 10.100, 132.91. 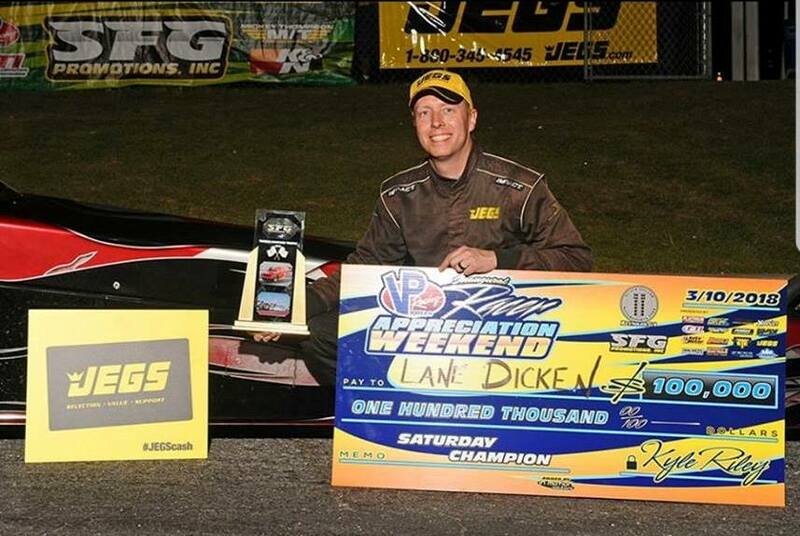 Cecil, GA - Lane Dicken from Lebannon, TN took home a cool $100,000 from the combined Saturday / Sunday $50k races defeating Tennessee Native, Racin Jason Lynch. Lone semi finalist of the combined race was Dennis Deal from Byron, GA.
Reynolds, GA - Live Coverage of the VP Racing Fuels Inaugural Racer Appreciation Weekend from Silver Dollar Raceway in Reynolds, GA begins Wednesday afternoon. CLICK HERE for Live Coverage and Race Chat! Reynolds, GA - David Rampy and Jeffrey Barker each clinched NHRA Lucas Oil Drag Racing Series World Championships this weekend at Silver Dollar Raceway and the Lucas Oil Drag Racing Series event. Reynolds, GA - Al Ackerman raced to the win in the NHRA Lucas Oil Drag Racing Series at Silver Dollar Raceway over the weekend. With just a handful of events left to finish the season, the Lucas Oil National and Divisional Championship races have heated up. Reynolds, GA - The title for Super Gas went to Jacob Elrod, out of Lima, Ohio, and his ’92 Corvette posting a lap of 9.893 seconds at 154.33 mph. This win now puts Elrod in the points lead for the Super Gas National Championship. Reynolds, GA - Rollins, representing the Super Street contingent, faced off with Steve Furr and his Super Gas entry in the final round. Reynolds, GA - Kevin Brannon, Boiling Springs, S.C., was victorious in Super Comp, Matt Weston, Wellford, S.C., grabbed his first win in Super Street, and Bill Earnest, Knoxville, Tenn., made it to his first final round in the Hickory Enclosed Trailers Top Dragster class to take the win.